It's a strange week to be a Star Wars fan. Those of us who have been supporting the franchise for a long time have effectively been told, if you didn't like The Last Jedi, get out of here, we don't need ya! A strange marketing technique, but one nonetheless being employed by a franchise that has lost its direction. As I write 42% of people registered to Rotten Tomatoes say they "Want to see" the new Han Solo movie. This is a Star Wars movie. So it's a strategy that's worked brilliantly so far. Anyway luckily we always have the world of comics to escape to and the good thing about the medium is that it is more fluid and can ebb and flow much easier than cinematic offerings. Despite its ups and downs, Poe Dameron has been a title that I've always looked forward to reading. 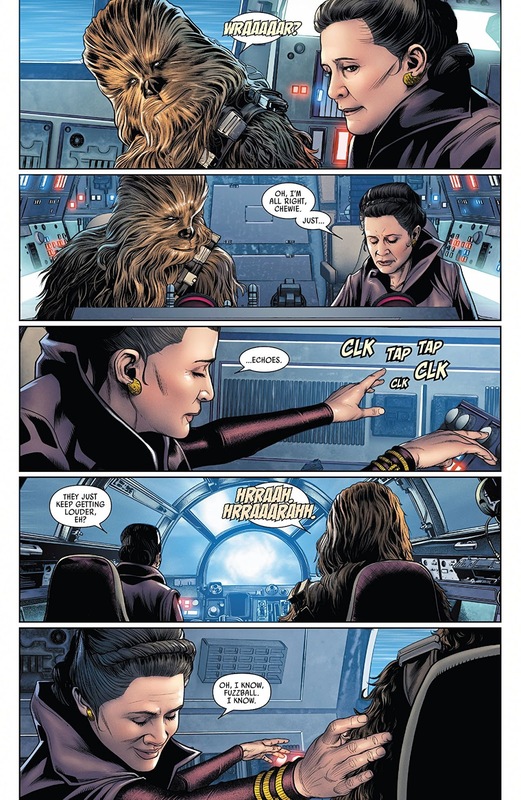 I was really impressed by the last issue which took us directly to the events after The Last Jedi and then told of the events during the story of The Force Awakens. This issue continues that story. It's a pretty intriguing story on a number of levels as well. Firstly we get a throwback to an intriguing aspect of Shattered Empire. That title was an excellent four-issue Marvel Star Wars comic book limited series by Greg Rucka, set immediately after the events of the 1983 film Return of the Jedi. 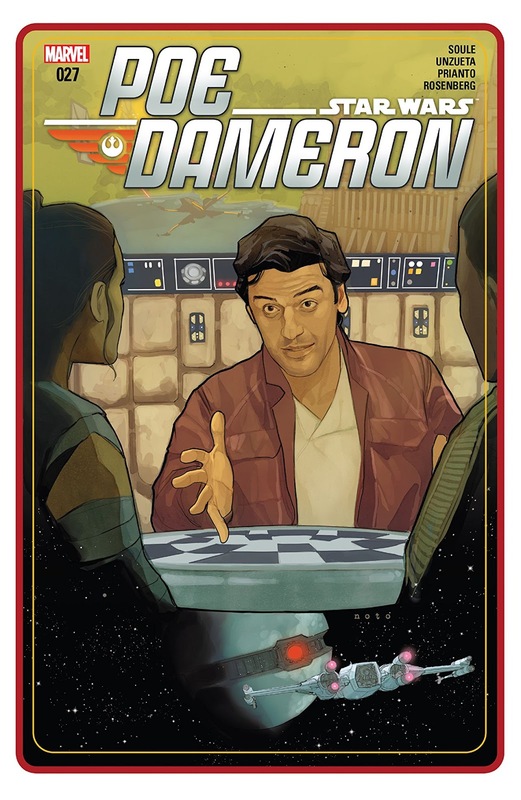 It features the parents of Poe Dameron, Shara Bey and Kes Dameron. That book featured several mentions of a Force tree and it is referenced again here, very casually (almost as casually as Luke Skywalker throwing away his father's lightsaber in The Last Jedi). It is intriguing to see it mentioned here nearly three years later, so something is going on. I always suspect there is more to Poe's backstory than meets the eye. There seemed to be some connection between Poe and Rey as well at the end of The Last Jedi (but again that could be cack-handed directing). That sense is underscored here for those who run with that theory, plus we see Rey and Poe exchange notes on Kylo Ren's torture techniques. As usual in this series the Angel Unzueta artwork is delicious, Prianto's coloring is very fine, and personally, I've really enjoyed the depiction of place in this issue, the poignancy of the post Crait scenes, the attack on Maz Kanata's place, the subterfuge of getting past the sensors on Starkiller base. There are great scene changes in this issue and the book benefits from it. I really enjoyed this issue even though I'm not in a happy place with Star Wars at the minute, but the opening pages of this book (which I don't want to spoil - they are included in this review if you want to read them) really tugged right on my heartstrings. 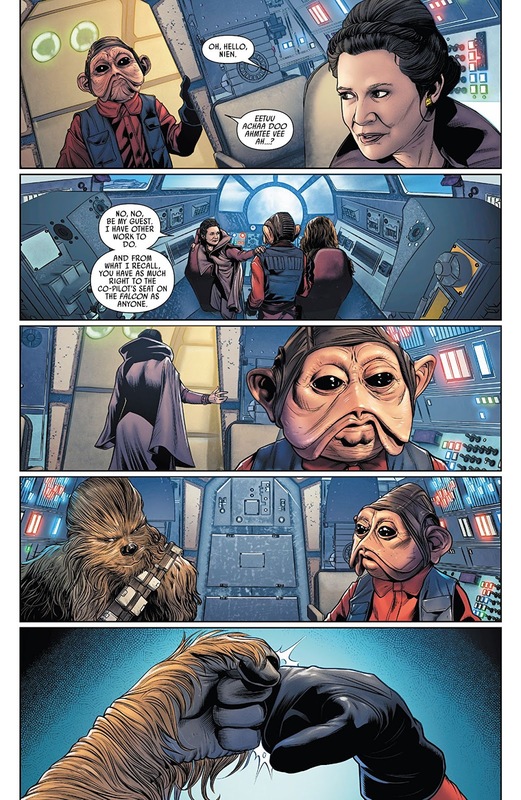 The issue had some really witty dialogue and laughs (including a Porg scene) that even a battle hardened old cynic like me was able to appreciate.